Just in time for winter’s approach, and the humidity finally falling and our skin (unfortunately) becoming dry and cracked.. Lets take a look at one of the most popular brands of skincare’s Intensive Repair Lotion. Eucerin Intensive Repair Rich Lotion comes in a large-sized pump bottle, and although it dispenses from a pump, it is still the richest lotion that I’ve ever bought that didn’t come in a jar or tub. I chose this lotion because it is fragrance-free, and will not cause an allergic reaction in those who are sensitive to perfumes. Plus, in the winter you tend to need to lather on more lotion, and it’s nice to have one that won’t interfere with your chosen perfume of the day. Upon first applying the lotion, my skin felt immediately softened and moisturized, and did not have any leftover greasy feel that left my skin feeling oily. That, and the truly fragrance-free formula made it a win in my book (some fragrance-free lotions still seem to have a scent in my opinion, but not this one). I can say that the lotion lasted well into my day, even when I was outside in the cold, AND after I had washed my hands numerous times. I did have to eventually reapply in the evening, but by that point my hands had been through a lot. This lotion is definitely a good go-to product for the cold months to come. 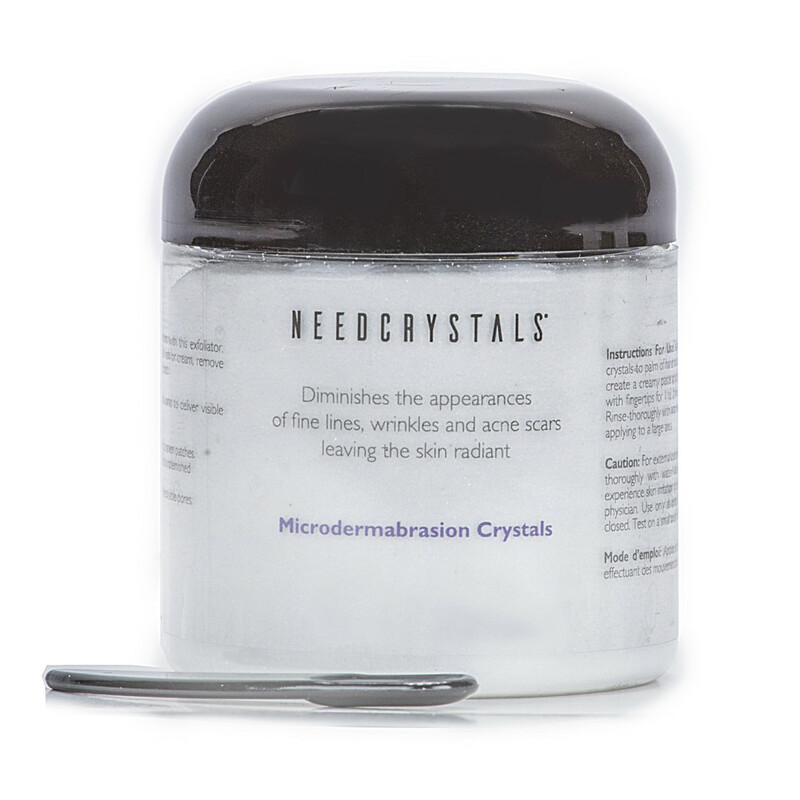 I’ve recently had the opportunity to review the Microdermabrasion Crystals from NEEDCRYSTALS. This came at a perfect time when the colder months are approaching, and exfoliation is key to keeping skin healthy and radiant. The product boasts that it sweeps away dead surface skin, clears pores to visibly reduce their appearance, and leaves skin clear, smooth and more even toned. What makes this product unique is that it is a jar of dry crystals, which you add to the facial cleanser of your choice. We love that you are free to continue using whichever facial cleanser is right for you, with the added benefit of exfoliation. And the jar of crystals goes a long way! In order to get the full effect, I used the product for two weeks to really give it a chance to give me good results. And I will say that I in fact did start to see results even after the first use. My skin felt smoother and softer within days of using the product, and after two weeks I do believe that my pores appear smaller, and acne marks seem to have faded a little. I’d definitely recommend this product for those looking to exfoliate their skin and reduce pore size. Add it to your favorite facial cleanser, and get the results of both products in one! Who doesn’t want more voluminous lashes? Well CoverGirl’s Plumpify Blast Pro Mascara promises 50X more volume, so we had to give it a try. Before even trying the formula, I noticed that the brush was slightly larger than average, and had a nice spiral shape which I was excited to try. Once I dipped the brush into the mascara, it looks a little clumpy but once I wiped a couple of the clumps off and try it, the formula delivered. I love the large brush, which really does seem to plump up your lashes, but it can be hard to get in the corners so that is one downfall. The mascara formula itself seemed average to me – nothing spectacular, but it did seem to keep my lashes separated and they looked long and full, which is pretty much all you can ask for. Description: “Our Plumpify blastPRO Mascara plumpifies your lashes with 50x volume boost for full lashes! This volumizing mascara has a specialized, double-action brush that vertically lifts lashes from their roots, guaranteeing plumping without the clumping — A whole new look in lashes, plumpified! Just in time for the hottest month of summer – and who doesn’t need to stock up on more sunscreen? Make sure you’re doing your research and choosing the best product for you. In search for a lighter weight and less greasy sunblock, I’ve decided to try out Coppertone’s new Clearly Sheer Sunscreen Broad Spectrum SPF 30. Upon first application, the sunscreen has a light scent (I tend to love the smell of sunscreens so am a little partial, but it is not overly strong). It goes on easily and smoothly and rubs in quickly with little effort which I like. The lotion is definitely not as thick as many sunscreens are, and you don’t have do to a ton of rubbing to get the “white” look to disappear on your skin. I also used the sunscreen on my face since it promises not to cause breakouts. My skin did not feel greasy or oily at all. Overall, the sunscreen does as it promises – no greasy residue and the formula is light. I had no issues with breakouts in the days after use, and it protected my skin from sunburn for the 2 hours that I was in the harsh rays. Curious about these new Micellar Water products that are popping up? Well FreeBeautyEvents has decided to give Garnier SkinActive Micellar Cleansing Water a try. The cleansing water promises to remove makeup, cleanse, and refresh skin in one step. No rinsing or harsh rubbing required. Safe for all skin types, and contains no oil, alcohol or fragrances. Upon first pouring some of the cleansing water onto a cotton ball, I noticed that it truly does not have a fragrance. My first thought was – “is this just water?” But once I started to rub the cotton ball on my face, my makeup starting coming off nicely, and my skin felt clean. I give the product a 4 out of 5 only because it took 3-4 cotton balls with the micellar water to completely cleanse my face (I was wearing foundation, however). I’d definitely recommend Garnier SkinActive Micellar water for times when you are in a hurry to remove makeup, when you’re on-the-go or traveling.